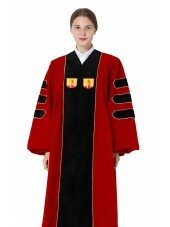 At Graduation Mall, you will find the most resplendent Deluxe Custom Doctoral Gown available. Whether in black trim with gold, or customized in your university’s colors, our custom doctoral apparel presents an impressive figure on commencement day. 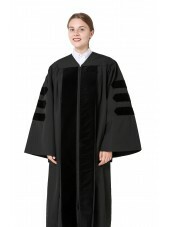 Our deluxe custom doctoral graduation gowns – in black trim with gold, is made with 100% polyester and gabardine featuring a velvet front with three matching bars on each sleeve. 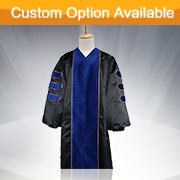 As with all of our academic apparel, the phd graduation gown can be customized in a variety of colors; depending on scholastic field of study. While black is customary, many institutions allow the option of embellishing the velvet bars for special scholastic achievements. 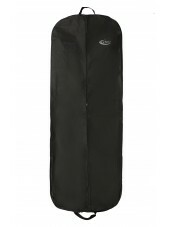 All of our garments are made from light-weight, crease resistant material. Our deluxe phd gown offer expert craftsmanship and hand-made top drawer quality. 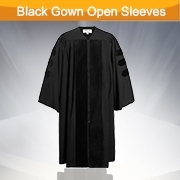 Not only are all of our graduation robes free flowing and comfortable to wear, they also offer highly decorative features that set the graduate apart from the others. Our perfect scholastic garments offer a darted, reinforced shoulder yoke with handcrafted fluting across the shoulder and back. Each detail has been thoughtfully planned out to bring our customers the highest quality available on the market. We endeavor to keep up with the latest trends and styles, ensuring that all of our academic apparel is on the cutting edge of fashion. 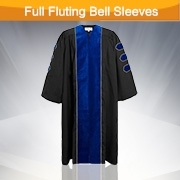 While we pride ourselves in fashion forward scholastic garments, we also offer a complete line of more faculty regalia purchase selections for those who prefer to follow a more traditional approach on commencement day. Of course, it is our highly competitive pricing that gives us the leading edge among the competition. 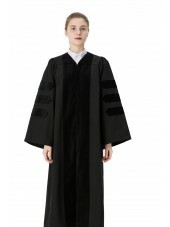 This is what our customers have come to expect from Graduation Mall.